Those of you that know me know that I am an avid sky watcher. I literally follow Kate Valentine’s advice to “Keep your eyes on the skies.” Likewise Don Ecker’s command “Keep your eyes pointed upward.” On March 5, 2012 that advice paid off. I was walking around a large pond in north central New Jersey with a friend between 7:30 and 9:00 p.m. and at around 8 p.m. I saw an amazing blue white fireball in the WSW sky careening toward Earth. It was moving more slowly than a typical shooting star. It was also very big being considerably larger and brighter than Jupiter which was also visible nearby. It had a short thick tail and the head of the fireball seemed to be rippling back toward the tail like molten metal. I was so startled that my mouth would not form words. I simply hollered and pointed. My friend said she thought something was wrong with me and continued to look at me rather than in the direction of my pointed finger and so did not see the celestial spectacle. I expected there to be a thud or shaking of the Earth but there was none. I continued to be excited, thinking that perhaps the countryside might be set ablaze by the object when it hit the Earth but there was no blaze. I wondered if it might be possible to discover any wreckage but caution and discretion prevented me from sallying forth into the underbrush. March 5th is a special anniversary for me and I had been hoping for a sign from the heavens for some time. Perhaps this was it. In any case I began conjecturing as to what the sighted object might be. It was not a comet, though its shape resembled one, because comets remain constant to the naked eye in the night sky and do not move perceptibly in a matter of a minute or less. They do not generally fall to Earth and if one does we can all bend over and kiss our butts goodbye. That night I searched the internet for news of a fallen spacecraft such as a satellite or UFO. No word of a problem on the space station, so the astronauts were fine. I decided to write a sighting report to both NUFORC (Peter Davenport’s National UFO Reporting Center) and MUFON (Mutual UFO Network) because what I had seen was unidentified to me and in hopes that I might get some information about what the object was. I was not disappointed. The following day I received both a phone call and an email from MUFON’s Ken Pfeifer. And many thanks to him! He furnished me with the photo seen at the top of this post. 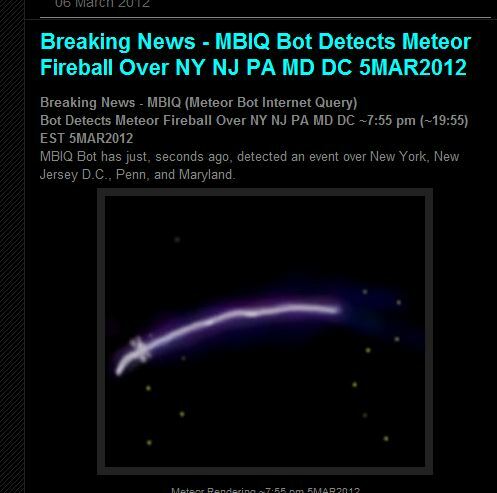 Apparently what I saw was a fireball and it was seen in five states and the District of Columbia. Am I glad I did not head off to look for the wreckage! The fireball I saw was probably of a type called a bolide. Amazingly I discovered that a fireball was also seen over Scandinavia and Great Britain the night before my sighting and it was golden red in color. http://www.bbc.co.uk/news/17248971 A woman in Scotland claims she found the meteorite while walking her dog. If so it is worth a decent sum, but I would definitely not sell. Saw another big fireball in the sky tonight in Clifton NJ, not half as big as last year’s March 5th fireball that I was privileged to see. I have another witness and also more reports of the same on http://lunarmeteoritehunters.blogspot.jp/ I feel very lucky to have seen two, but wonder if we are going through a “busier” and therefore more dangerous part of the galaxy.